Among the over sixty Lamborghini Huracán Super Trofeos taking part in the World Final in Valencia, there will be one in particular to be carefully monitored. It will be the car number 100 “dressed” in a very original livery and its driver is a famous champion on two wheels. It is Andrea Dovizioso, official Ducati Team MotoGP rider, who will participate as a VIP guest both in the sixth round of the Blancpain Super Trofeo and in the World Final, scheduled from December 1 to 4, behind the wheel of a Huracán Super Trofeo fielded by Lamborghini Squadra Corse, the motorsport department of the manufacturer of Sant’Agata Bolognese. Now in his fourth season with Ducati Corse, the 30-year-old rider from Forlì has taken part in 258 World GPs (of which 160 in MotoGP, where he scored his most recent victory in Malaysia last October) and is very familiar with the Valencia track. Besides hosting every year the last round of the season of the MotoGP championship, the unbeaten record of highest speed reached on the Ricardo Tormo circuit is actually held by Andrea Dovizioso: 335,9 km/h reached in 2015 with his Ducati Desmosedici GP. 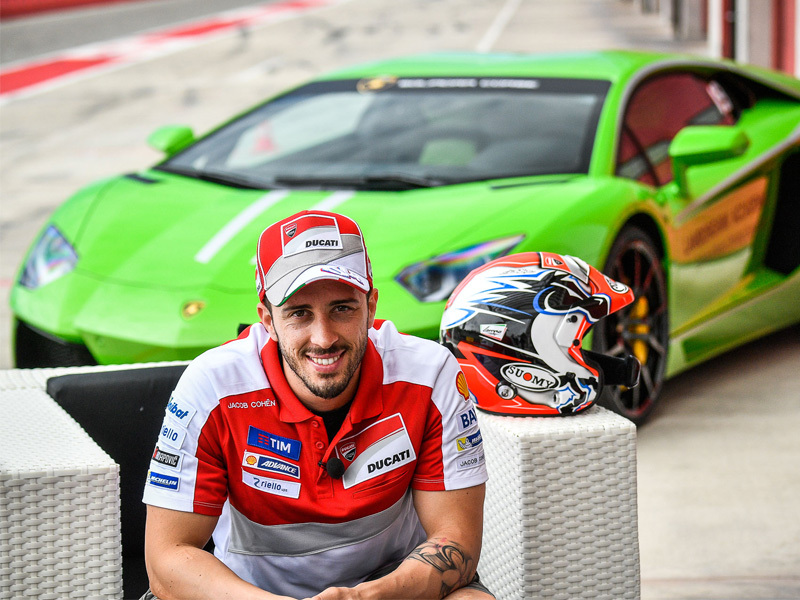 For the Lamborghini Huracán Super Trofeo, Andrea Dovizioso will naturally have to adapt his driving style to the four wheels. But the Italian rider, who can rely on the support of Lamborghini Squadra Corse, has already had a taste of the potential of the Huracán, since he participated in the Lamborghini Track Accademia at Imola last May, where he did some training with his “colleague” of the manufacturer of Borgo Panigale, the Australian Casey Stoner. The competitive events scheduled in Valencia will start on Thursday, December 1st with the first free practice and qualifying sessions. Races will begin on Friday and each competition will last 50 minutes, with a rolling start. The protagonists of the Asia and North America series will be the first to get to the track and will share the grid. Race 1 will start at 8:50 and will be preceding those of the Europe series for the classes AM/Lamborghini Cup (scheduled at 10:20) and PRO/PRO-AM (11:50). Race 2 for Asia and North America will kick off at 13:35 and will be followed by those of the Europe series for the classes AM/Lamborghini Cup (15:00) and PRO/PRO-AM (16:25). Saturday morning, the day will start with the qualifying sessions of the World Final and Race 1 of the classes AM/Lamborghini Cup (12:15), PRO-AM (14:15) and PRO (15.55). On Saturday, Race 2 of the classes AM/Lamborghini Cup will kick off at 9:30 and will be preceding those of the classes PRO-AM (11:30) and PRO (14:05). All the races can be followed in live streaming on the web site of Lamborghini Squadra Corse: http://squadracorse.lamborghini.com/live-streaming. You can also relive the emotions of each of them on the official YouTube channel of Automobili Lamborghini: http://www.youtube.com/lamborghini.